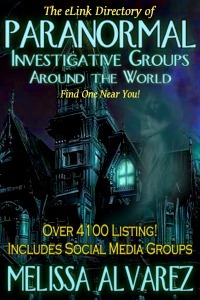 The eLink Directory of Paranormal Investigative Groups Around the World: Find One Near You! As the original national paranormal examiner at Examiner.com, I created a huge list of paranormal investigative groups around the world to aid those who were looking for a group in their local area and who wanted to meet other like minded people as they traveled. The list was an enormous success so I decided to make it available again as an ebook. I’ve expanded the original lists and as of this writing, the ebook contains more than 4100 listings. Not only have I included individual investigative group’s websites but I’ve also included Facebook, Yahoo and LinkedIn groups. While all of this information is available through online searches, I’ve done the work for you and scoured the web, reviewing thousands of websites in order to create this extended elink directory of paranormal investigative groups around the world. You can also access each website’s information directly from your eReader device if it has internet access or via your computer. I originally included both the linked name of the group and the direct URL to the page for easier access, however, the file size was enormous. It was so large that I was unable to upload it to some retailers. So I removed the direct URL’s from the social media groups but left them in the listings by state. You will also notice that many people have used the exact same names for their groups, however, the URLs are different and they are different groups. Because there are a large amount of groups around the world, with new teams starting all of the time, I have obviously omitted groups, but will gladly add yours to the next edition. While all listings are accurate at the time of publication, some listings may not be valid if the group closes after this book is released. Therefore, any invalid listings will be removed in the next edition. If your team would like to be included in the second edition of The eLink Directory of Paranormal Investigative Groups Around The World I would love to include you. If you don’t see your group listed and would like to be included, if you find a broken link or know of a website change, or if a group is out of business or has moved to a different URL, please let me know by sending an email to paranormal@melissaa.com and I’ll make all of the necessary additions and changes in the next update.